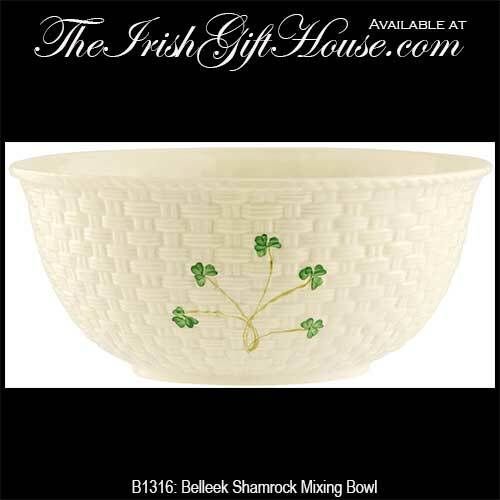 The Belleek shamrock mixing bowl was Introduced in 2016. 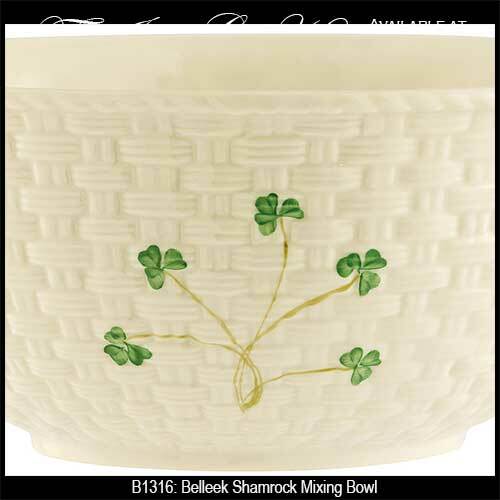 The Belleek shamrock bowl features the famous embossed basket weave design along hand painted green shamrocks. This Belleek bowl would be ideal for serving or for display and measures 4 1/3" tall x 9 1/2" wide. This Irish dinnerware is handmade and hand painted in Belleek, Ireland and it is gift boxed with a shamrock history card, complements of The Irish Gift House. Belleek dinnerware is safe to use in the dishwasher and microwave along with the freezer and oven (to 375F). This piece of Belleek dinnerware features a large serving tray with hand painted shamrocks. This piece of Belleek China dinnerware features a oval platter with hand painted shamrocks.